This post is about my use of design technology that assisted me in building several mechanical action pipe organs as an independent pipe organ builder. I am going to use the original design objects that I used to build the organ described in my previous post here as examples. 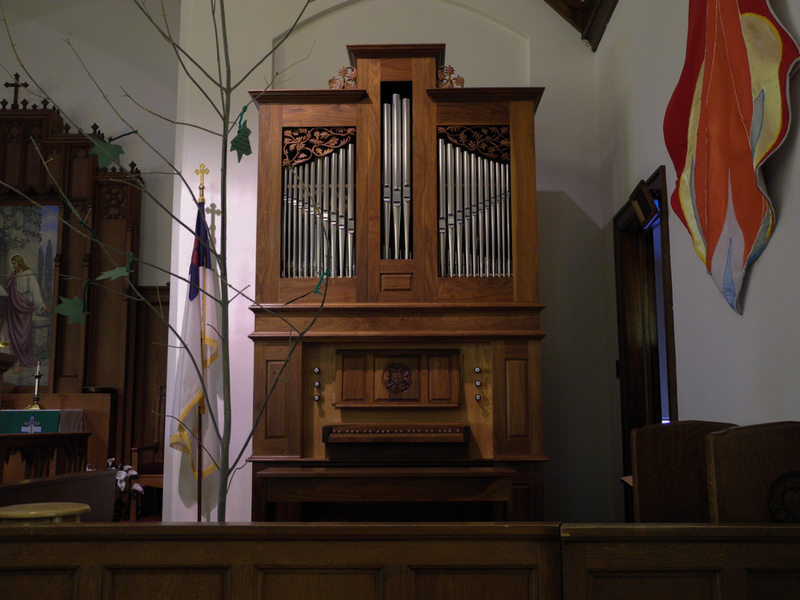 That organ was designed as a new instrument built around a core set of late nineteenth century artifacts. The challenge lay in creating a valid functional design built around those artifacts that were specifically three sets of discarded organ pipes still valuable for their great tonal beauty. An interesting aspect of that pipe organ, and all subsequent that I built, was the use of technology to help successfully achieve the final results. It must be apparent from my previous posts that I have a strong background in computer aided design and manufacturing technologies. I wrote several computer programs for pipe organ design shortly before I began building pipe organs as an independent builder. 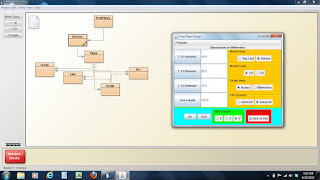 The programs automated and simplified tasks that were particularly challenging by creating useful geometry in a computer aided design and drafting program. Pipe groupings that make up the front of an organ case are a traditional part of early organ building, and one of the tasks I simplified by using a purpose written computer program was to accurately model the front pipes that would form part of the organ case design. 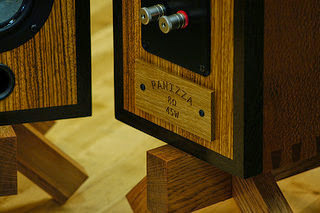 The front case pipe grouping for an organ I built is represented here in both its computer form, and in a photo of the actual instrument. 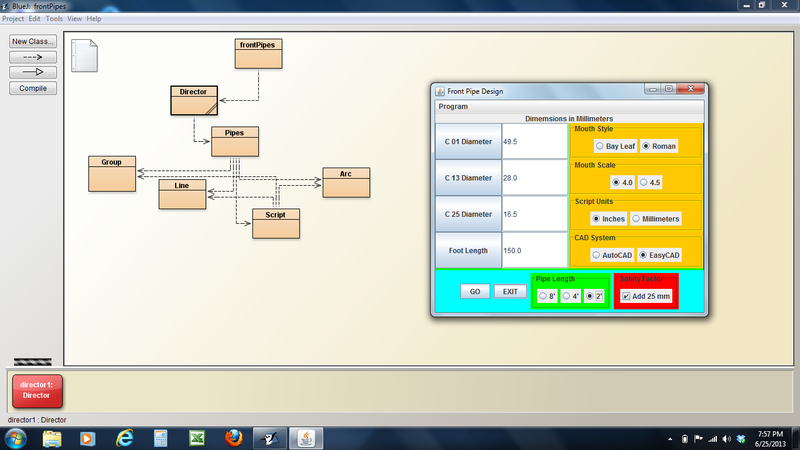 The image at the top of this post is a screen capture of an organ case pipe design program I wrote using a Java development tool called BlueJ. I used BlueJ to program in Java while briefly working at a small private liberal arts college that followed my stint as an organ builder, and I found myself in a position there to learn an object oriented computer programming language. The original organ case design program was written in a procedural programming language, and I used the opportunity to rewrite one of my organ design programs in a new programming language paradigm to significantly lessen the learning curve. 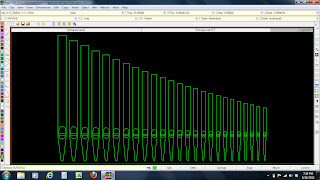 The organ case pipe design program like the other programs I wrote created a script file of drawing commands that produced accurate geometry when read into a computer aided design program. The result of the case pipe design program was a set of twenty-five accurately dimensioned pipes interpolated from three user input octave dimensions that determined the scale of the set. The interpolated values were accurately computed using geometric progressions. The pipe geometry created in the computer aided design program could then be used and edited to create a set of pipe groupings visually appropriate to the intended organ case design. I hope the screen images included here adequately demonstrate this process without going into any further discussion that would be well outside the scope of this post. Windchest design with nested pipes in plan or top view represented another major design challenge that I simplified by writing a set of rule-based winchest design and pipe nesting programs. A screen shot of the windchest design in plan view for the first organ I built is shown below. 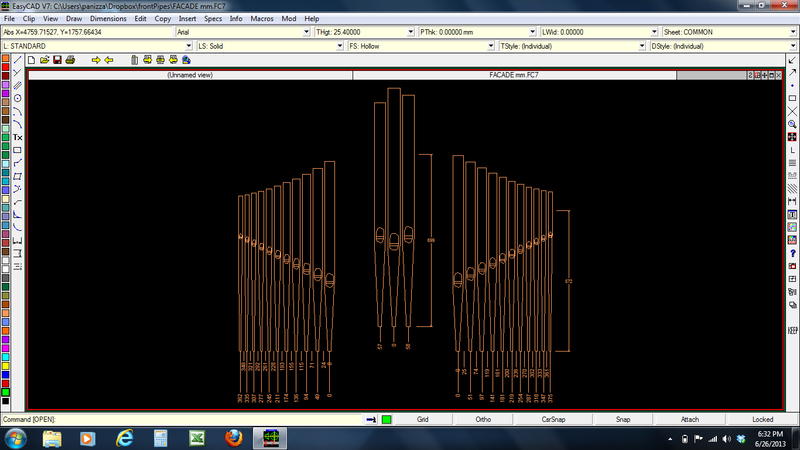 The rectangles represent the plan view outlines of the wood organ pipes, and the outer circles represent the plan view outlines of the metal organ pipes. The inner circles represent special devices called slider seals. An associated computer program would calculate the appropriately sized slider seal based on the wind requirement of its corresponding pipe, and represent it in the drawing as a uniquely colored circle.